So the original post that I found for this cake called it a "breakfast cake." Upon reading the ingredients, I've decided to just call it "cake." Let's be real people! 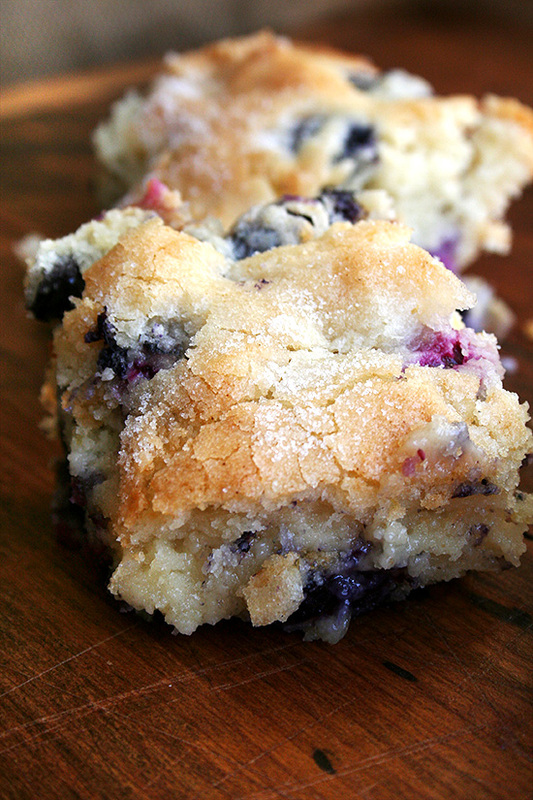 I guess you could start off your day eating this, but around our house, it's a sweet treat (and I rarely make those). I did make a couple alterations to make this cake a little bit healthier (or a little less unhealthy, depending on how you look at it). My boys loved it with a dollop of fresh whipped cream. 1. Preheat the oven to 350ºF. Cream butter and applesauce with lemon zest and stevia until light and fluffy. 4. Grease a 9-inch square baking pan. Spread batter into pan. Sprinkle batter with remaining tablespoon of sugar. Bake for 35 minutes. Check with a toothpick for doneness. If necessary, return pan to oven for a couple of more minutes. (Note: Baking for as long as 10 minutes more might be necessary.) Let cool at least 15 minutes before serving. Loved this recipe that I got (and tweeked) from Pinterest. This makes a HUGE batch! Feel free to cut the recipe in half, or do what I do and freeze half for later use. I'll be experimenting with more quinoa combos later. I'm thinking a TexMex cilantro lime one next! 1. Saute onion in olive oil until tender. Add curry powder, quinoa, broth & juice. 2. Bring to a boil. Cover and simmer for 12-15 minutes until quinoa has absorbed all the liquid. 3. Fluff with a fork. Stir in frozen peas and season with salt and pepper. My brother-in-law makes the best hummus in the world! His dad is from the Middle East so you know it's legit. I finally got his recipe and I'm so excited. Thanks Dave! Blend together beans, garlic, tahini, spices, olive oil, lemon juice, half of the parsley and half of the toasted pine nuts in food processor adding water last until desired texture is reached. 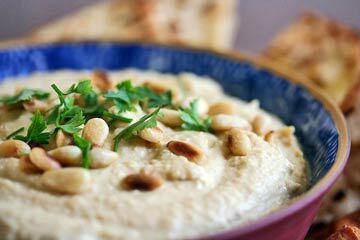 Serve smoothed out onto a plate with a sprinkle of paprika, olive oil, lemon juice and garnish with remaining parsley and pine nuts. Serve with toasted or warmed pita slices. 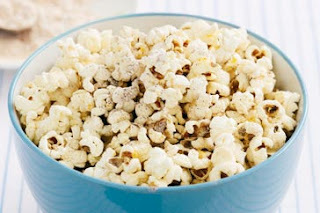 I found this yummy popcorn recipe & wanted to try it for my book club. Unfortunately, I can't find the link again, but I remember the recipe. It's kind of like kettle corn, with a snickerdoodle twist. The ladies loved it! And I found an awesome method for popping popcorn in the microwave thanks to Pinterest. It's fast and easy and perfect if you don't own an air popper. 1. You will be popping the popcorn in 2 batches. Place 1/2 c. of popcorn kernels in 1 paper bag. 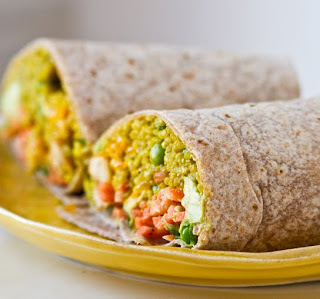 Fold over a couple times & stand upright in the microwave. Pop on HIGH for 2 1/2-3 minutes. Repeat with the remaining popcorn. 2. 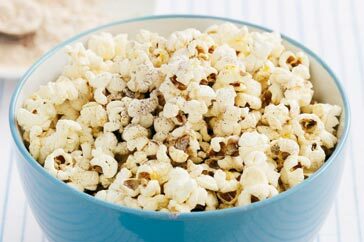 Pour popcorn in a large bowl for mixing. 3. Melt the butter in a small sauce pan. Add the rest of the ingredients & stir to combine. Drizzle over popcorn and toss to coat. 4. Pour popcorn onto a cookie sheet & bake at 300 degrees for 10-15 minutes. This will guarantee crispy (not soggy) popcorn. I'm starting a detox today. Whole foods only, starting out with fruits/veggies/nuts only. 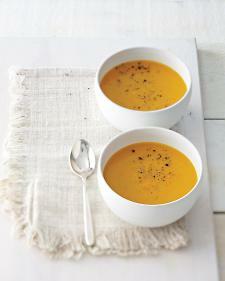 Here's a recipe (that I modified slightly) from Whole Living that is delish! It's foods like this that make a cleanse easy. Heat olive oil in a medium saucepan over medium heat. Add onion and garlic and cook until tender, 6 to 8 minutes. Add spices and cook until fragrant, about 1 minute. Add carrots, apple, squash, and 3 cups water. Bring to a boil; cover partially and reduce to a simmer. Season with salt and pepper. Cook until vegetables are tender, about 20 minutes. Let cool slightly. Working in batches, puree until smooth in a blender. Adjust seasoning, if necessary.